The Professional Regulation Commission (PRC) officially announced on Thursday, October 2, 2014 the complete list of passers for September 2014 Electronics Engineering (ECE) and Electronics Technician (ECT) board exam. 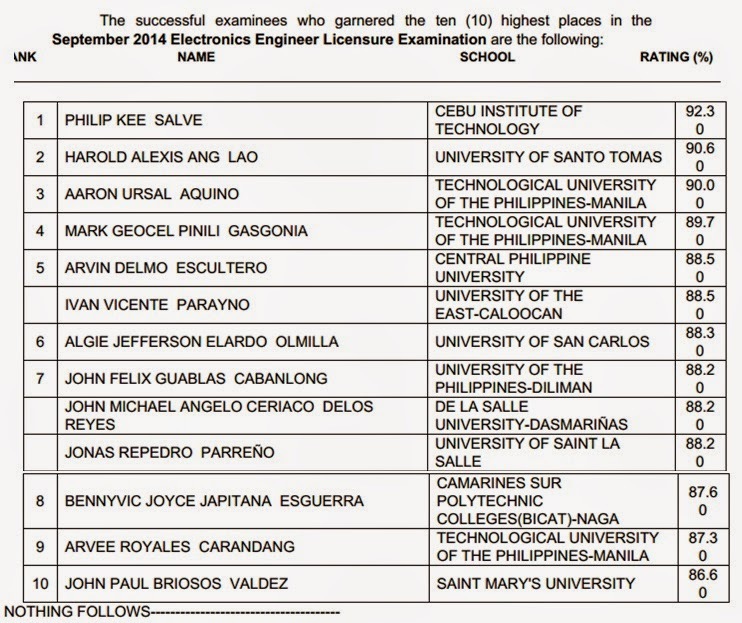 Philip Kee Salve of Cebu Institute of Technology topped the ECE board with 92.30 percent grade. Harold Alexis Ang Lao of University of Santo Tomas (UST) ranked second with 90.60 percent grade. Meanwhile, graduates of Southern Luzon State University (SLSU), Central Colleges of the Philippines (CCP), Cebu Institute of Technology (CIT) and Polytechnic University of the Philippines (PUP) - Sta. Mesa topped ECT board exam.